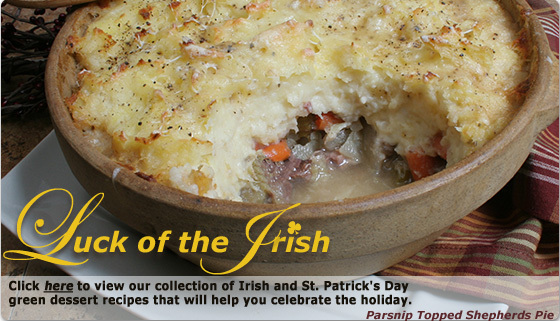 The “luck of the Irish” will be yours on St. Patrick’s Day when you prepare Recipe Tips’ tasty recipes inspired by the Emerald Isle. 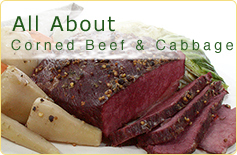 Give your mealtime an Irish flair with our selection of main dishes, such as corned beef and cabbage, Irish stew, or corned beef hash; enjoy an afternoon coffee or tea break with Irish soda bread, barm brack, or scones; and think “green” for dessert with our irresistible selection of green St. Patrick’s Day treats, such as pistachio pie, minty ice cream sandwiches, or bit-o-green cake. 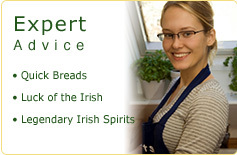 RecipeTips.com has all of these and more, which are guaranteed to make your St. Patrick’s Day celebration memorable and delicious.